There's a formula for French Polynesian tourism – blue lagoon, green mountains, white sand beaches, and ultra-luxury hotels. 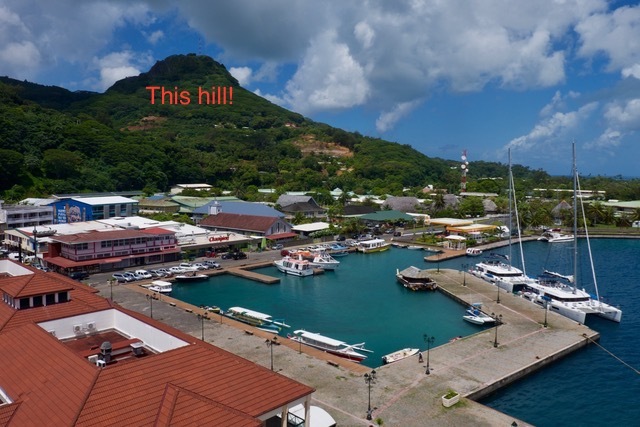 Raiatea has the first two covered, but without any beaches of note it has never attracted the luxury market. 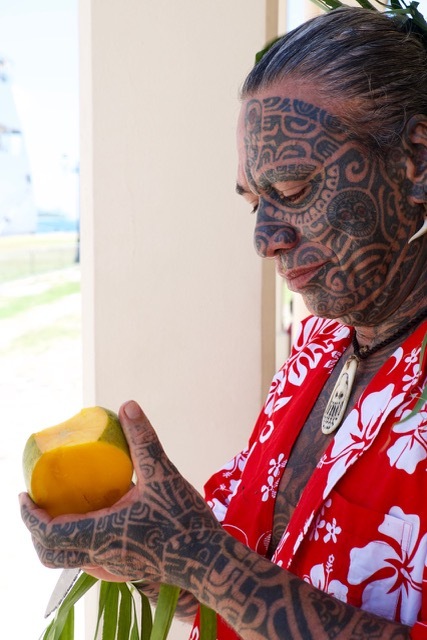 And that's Raiatea's charm – it's an uncomplicated, unsophisticated (in a good way), untouristy place that retains the atmosphere of French Polynesia as it used to be, before tourism arrived. Plus the presence of away! ), and he didn't believe in work, in having electricity, or possessing money. Of course, a guide who tourism – he saw himself as a challenge to it. And, as we toured around this absolutely beautiful island, it was hard to say why it's off the tourist agenda. There were lushly vegetated mountains, stunning views over the lagoon, and a laid-back pace of life that seemed to be rooted in a back-to-basics attitude from the friendly locals. 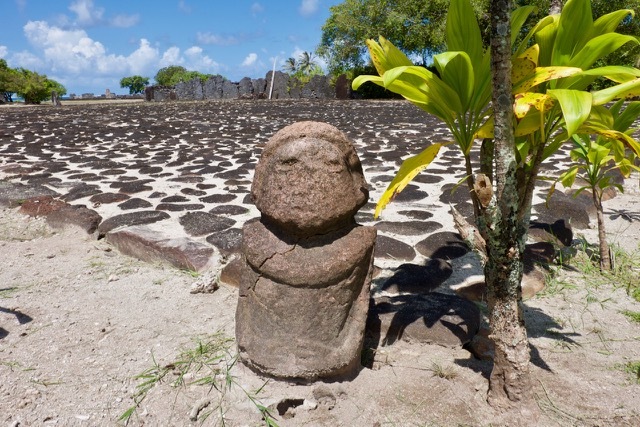 The main attraction was pretty spectacular too – the Marae Taputapuatea – a complex of about 6 different sacred Marae, temples which were the very centre of Polynesian beliefs for about 1,000 years before the missionaries arrived. 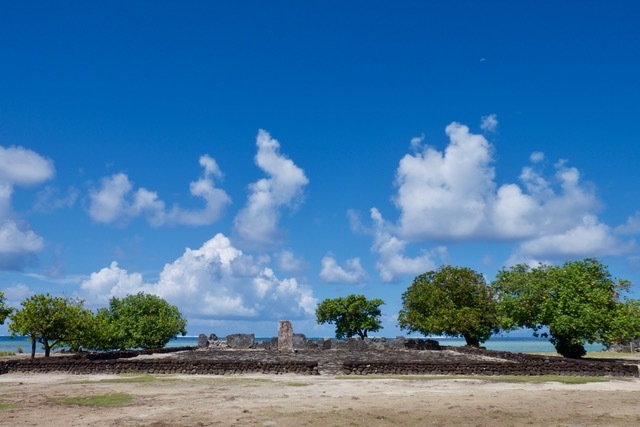 The marae has been well restored and is in a stirring location by the sea – the great explorers (who supposedly colonised the rest of Polynesia from here) came here to be blessed before they passed through the sacred pass of the reef, and into the crashing waves of the Pacific. What makes the site even more interesting is that this was the only marae that had an international dimension – chiefs from New Zealand and the Cook Islands would sail here (incredible feats of navigation in themselves) to get blessed. Even today, the marae is a site of pilgrimage; and even though it didn't have the same force of mystical power that I detected at the moai of Easter Island, you could feel that this was a place of enormous significance. 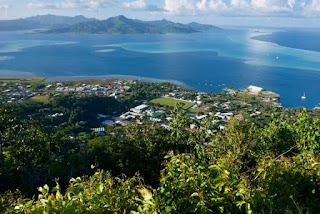 It was a roasting hot day, but after the tour had ended, at 5pm Tracy and I embarked on another Raiatea rite of passage – the climb up the 300 metre tall Mount Tapioi that sits behind the island's sleepy capital, Uturoa. It's a really pleasant grassy path that takes you up through the rural landscape up the side of this mountain, getting steadily steeper (and sweatier) as you approach the summit. 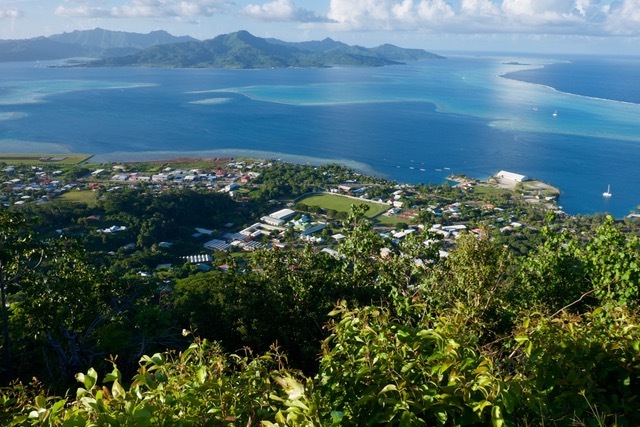 But, after a fairly exhausting 40-minute climb, the breathtaking views from the summit made it all worth it, as you looked over the lagoon to Raiatea's twin island, Taha'a, and then across the ocean to the jagged outline of Bora Bora in the distance. It made for a truly spectacular sight. Having feasted on the views, we then raced to get down before the sun set, reflecting that this must be a pretty good place to live. 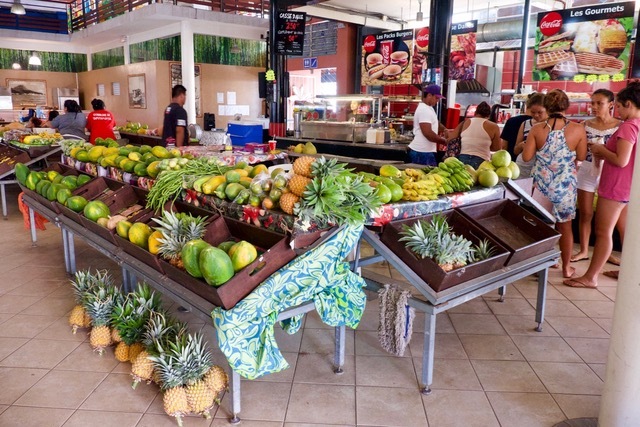 It's less crowded and less westernised than over-developed Tahiti. While it's not as visually stunning as Moorea or Bora Bora, it still looked pretty good, and it's certainly a lot more genuine in its atmosphere. 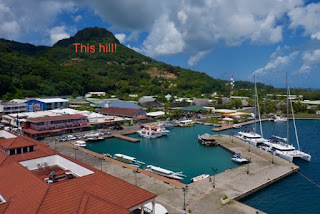 Raiatea's hotels may be hostels, the buses may be uncomfortable, the guides may be unconventional, but I hope that tourism doesn't discover Raiatea for a long time yet. I like French Polynesia "as it used to be".